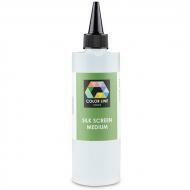 Add this Silk Screen Medium to your Color Line Silk Screen Paste to make it thinner. Use a few drops and stir in well. Repeat until you achieve the desired consistency. For more tips, download our Using Color Line Screen Paste PDF.